This glamorous, Hollywood inspired power room has a custom upholstered wall of faux leather tiles which act as a water resistant back splash behind the vanity. Drawer pulls - Where did you buy drawer pulls? They are so nice. And how long are they? Leather tiles? Please share. Thanks! Mirror - Can you please tell me where this mirror is from? Thanks! Do you have anymore mirrors available? Where is the resource for the faux leather back tiles near Charleston? If you are in Atl, I can have them made for u. Can you please share your resource for the faux leather? Love! Thank you! The pulls are from Mathew Quinn Collection in Atlanta. They sell all kinds of luxury hardware! where is the back panel from?? so beautiful! 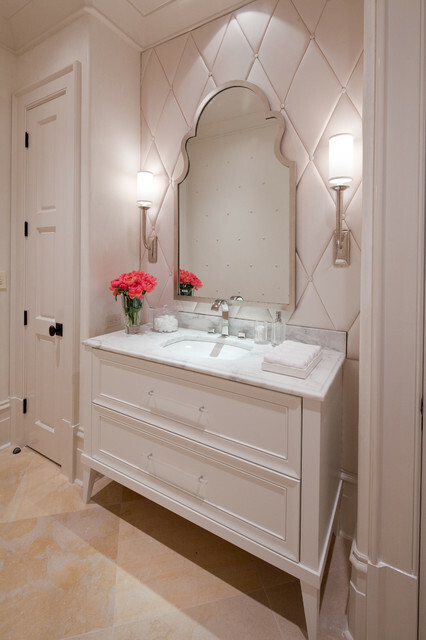 Beautiful Vanity - Very pretty bathroom; can you share the dimensions of the vanity please. Thank you. I believe it was 36" to 42" wide. Good luck on your project!! What are the dimensions of the mirror? - What are the dimensions of the mirror? Really Like the Vanity? where can I find it? I would love the name of the cabinet maker that built this piece. Thank you. It would be very kind. Your funny! This happens to be a guest powder in a 7 million dollar mansion. The have over 10 bathrooms with plenty of vanities, dressing wardrobes, etc. Good luck with your project!!! i love this faucet it is perfect. Can you tell me who makes it? Thanks - i love the faucet who makes it? Thank you for the compliment! It is from Dorn Bracht's, MEM Collection. Great sconces - Do you know the brand and model of the sconces? Hi where I can get this vanity?